2nd ODI Adelaide: India opener Rohit Sharma impressed fans when he spoke in Marathi during an interview ahead of the 1st ODI at SCG. 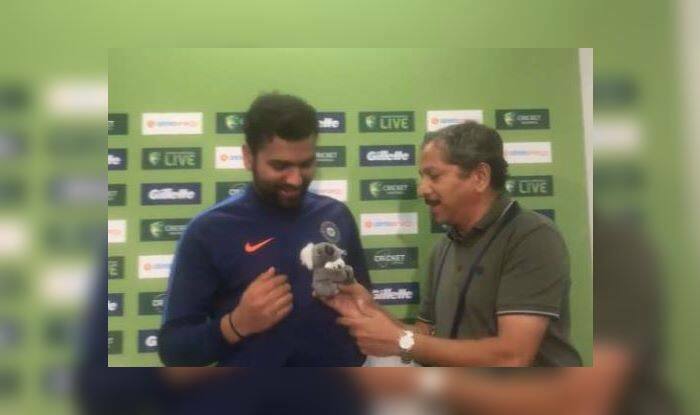 2nd ODI Adelaide: India opener Rohit Sharma impressed fans when he spoke in Marathi during an interview ahead of the 1st ODI at SCG. It was an Indian journalist Sunandan Lele who posed a question to Rohit in Marathi, to which the cricketer laughed and asked if he could reply in Marathi to everyone’s surprise. The journalist gave him a go-ahead and then Rohit started speaking in his mother language. Here is the rough English translation of the interview. Sunandan Lele: Rohit, few days left before World Cup to go and no test matches for the next seven months. As a vice-captain, how do you look at the ODIs coming up? Rohit: (smiles) You want this in Marathi? Ok…I think we have 13 ODIs left for preparation. But we aren’t looking at them as preparations. We want to win the series. And as we go about it, we will be preparing, testing our combinations for the World Cup. Sunandan Lele: Have you managed to plug the small loopholes in batting, bowling etc? Rohit: Well the loopholes will remain even during the World Cup. No team is perfect. There will be weaknesses, yes. But what we want to see what our strengths are, and we will be focussing on them. That’s what we have done over the last two years and we have done it well. We are trying to work on our weaknesses. But that gives us an opportunity to see where we need to be careful. Every team has its own weaknesses. Sunandan: We have brought you some sweet as you have become a father now. Rohit: Arre, I should be giving you all…thank you all. Thanks for this. Rohit was the only player who got among the runs at SCG, he slammed a brilliant 133 off 129 balls but his century went in vain as India lost the match by 34 runs. Meanwhile, the Men in Blue would be hoping to bounce back at Adelaide and square the series 1-1. The second ODI at Adelaide is on January 15.